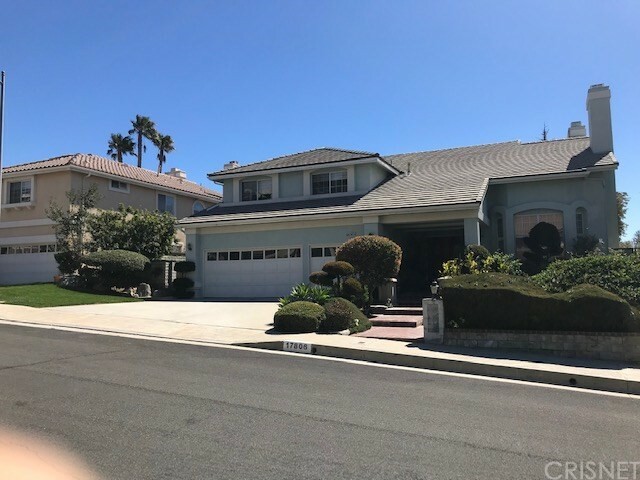 All Granada Hills homes currently listed for sale in Granada Hills as of 04/26/2019 are shown below. You can change the search criteria at any time by pressing the 'Change Search' button below. 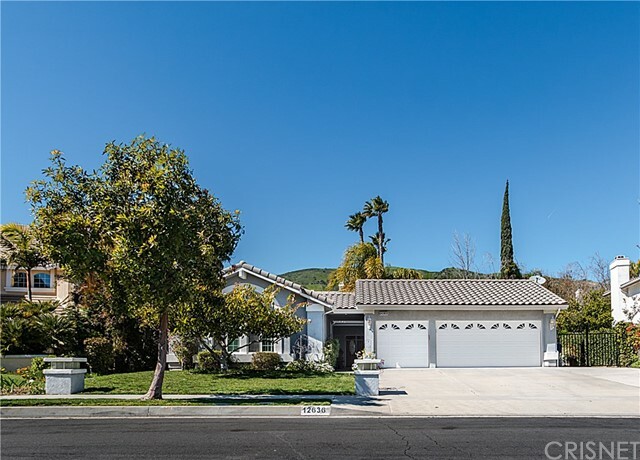 If you have any questions or you would like more information about any Granada Hills homes for sale or other Granada Hills real estate, please contact us and one of our knowledgeable Granada Hills REALTORS® would be pleased to assist you. "Views, Views, Views and sparkling pool!! There are no words to truly describe the beauty of this exquisite, one of a kind estate! 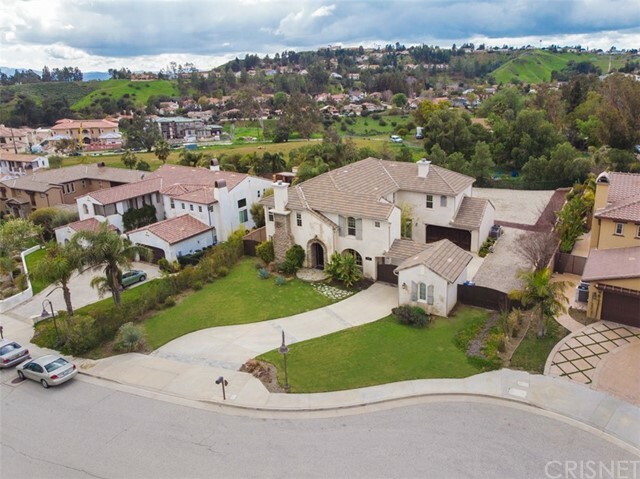 Located in Cagney Ranch Estate 5 bd +loft +bonus room +office with 5.5 baths, 6533 sq.ft, around 2 acres lot,3 car garages property shows like a CASTLE, located in the cul-de-sac! One suite bedroom downstairs with full bath. Wrought the amazing entry door welcome you to grand foyer featuring the cathedral ceilings, wood wall panels, design marble, and travertine floors and beautiful crystal chandeliers. The extravagant living and family rooms with fireplaces, shiny floors, crown moldings, stunning wallpapers covering walls, doors to the back yard. Wet bar in family room. Huge dining room with the pantry. The kitchen features 2 built-in refrigerators, Wolf appliances, granite counters, large center island with sink, huge pantry 2 staircases. Surround sounds, vacuum system. The master suite with the fireplace and stunning view! The luxurious bath is highlighted by a center jacuzzi tub, covered by granite and design travertine, huge walk-in shower and 2 closets with the organizers. Private balcony from the loft to enjoy the view. Step outside to experience resort living in your own backyard with the stunning city and mountain views! Featuring breathtaking landscaping, pool with design on the bottom, spa, water features, firepits, huge cover patios, BBQ area. Solar panels for the pool are paid off." 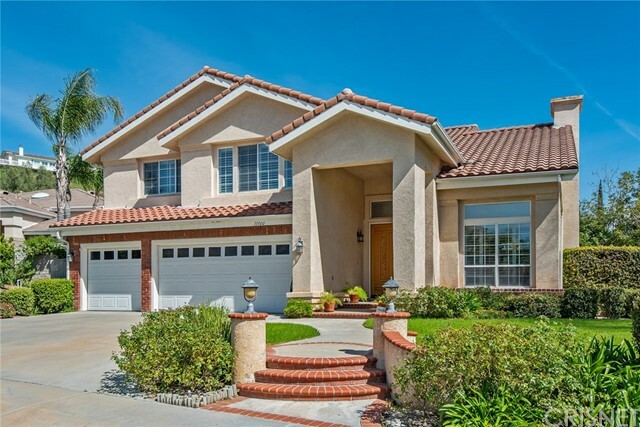 "Beautiful large estate in Granada Hills with 5 spacious bedrooms and 5 bathrooms. Completely renovated home with the new water filter system, solar panels, new garage cabinetry, new blinds, and new backyard lights. Marble flooring downstairs and newly installed bathroom mirrors. All appliances are newly updated to Thermador. 4 fireplaces on the property and a newly built safely inside the home. Swimming pool and new BBQ grill and countertop in the backyard. You don't want to miss this resort like home with beautiful mountain views." "Gated, Secluded, Hilltop Retreat on its own hidden hilltop behind gates, nestled amongst cedars of Lebanon and tall pine trees. Prime location close to the 118, 405 & 5 fwys. Level 1 - Entertainment level with a Pro Indoor Racquetball Court. A large oak bar w/ fridge & dishwasher. A pool table and area great for Parties. Double sets of french doors lead to a large 10 Jet Jacuzzi, spilling into a 20x50 pool. The Natural Forest of trees provides ultimate privacy! A steam shower in the bathroom as well as a bath. Also, a large cedar sauna & bedroom on this level. Level 2 - Main living area featuring a gourmet kitchen w/ built-in SUB-ZERO refrigerator & freezer, center island, cook top with BBQ grill, double oven, lots of cabinets w/built-in wine racks. Vaulted cedar beams w/ skylights highlight the kitchen. Beams extend to the living and dining area w/ an oak fireplace & flat screen TV. Sliding glass doors take advantage of the view from inside or on the balcony that overlooks the pool area. A library w/built-in desks & bookshelves w/ a balcony that spans to one of two large bedrooms & 2 1/2 baths. Level 3 - Master suite w/its own private retreat, fireplace, full wet bar, his & her baths w/ walls of mirrored closets, duel shower, jacuzzi tub set in a bay window. There is also a private balcony. Other features: Alarm system, security cameras, gated entry w/ intercom, five a/c units, two laundry rooms, a 6 car garage and room for RV parking." "Turn-Key custom MODEL built View home sits in a private gated community of 13 homes. Enjoy plush grounds as you drive into the gated courtyard that leads to a three-car garage, the courtyard is large enough for kids to play, park an RV or to entertain. Welcome guests through a luxurious, open and welcoming entry into the home. The beautiful travertine stone and hardwood floors are throughout the home, and beautiful granite counter tops. The kitchen includes an over-sized kitchen counter that overlooks the large great room. Downstairs includes a guest suite and bath amenities. Upstairs includes 4 bedrooms, Master En-suite with its own retreat with city and mountain views, fireplace, and Jacuzzi tub. All bedrooms upstairs have beautiful natural light and great views from every room. The entertainers back yard boasts beautiful private and a serene setting on a flat and large lot with an area to enjoy with family and friends and kids to play, or large enough to build a guest house. 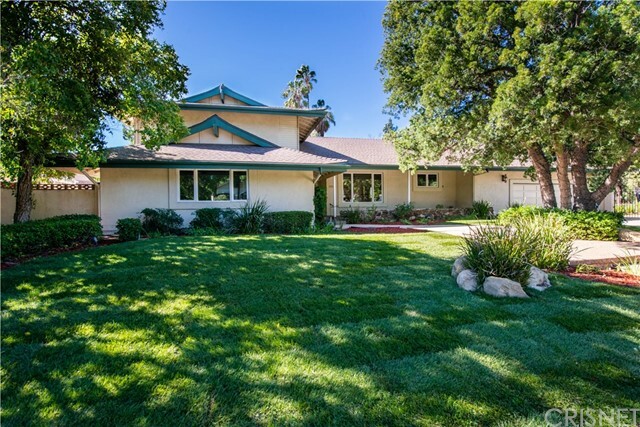 Granada Hills High School District - Tucked away yet minutes from the 118 and 405 freeway." "Beautiful mediterranean Bridlewood estate home with incredible views and pebble tech saltwater pool and spa with rock waterfall. Too many upgrades to mention. Interior: Complete hardwood and granite floors throughout home with ornate mosaic entry floor at entry. All bathrooms have been upgraded with floor to ceiling custom stonework and spa tubs. Upgraded lighting throughout with recessed and track lighting and sconces. A fabulous crystal chandelier adorns the living room and Murano glass in the dining room. Media room and office added with ductless HVAC, second kitchen and storage. Murphy bed in the guest bedroom. Built in cabinets and closets with quartz counters. 2 new tankless water heaters. Exterior: Walk around your architecturally designed gardens with a walking path carved out of the hillside leading to the view deck with new custom metal railings and gates. Drip irrigation supplies the native plants. Jacaranda and Olive trees adorn the gardens. Truly a paradise!" "PRICE REDUCED $100,000!! 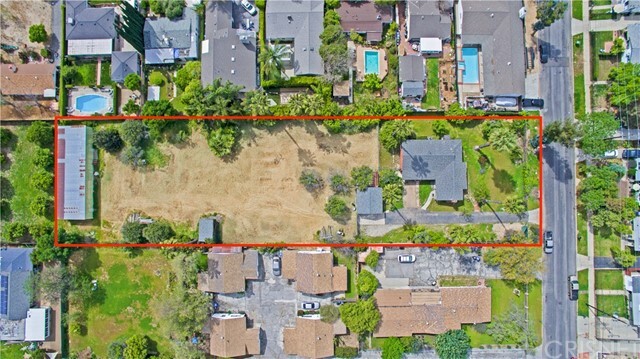 FABULOUS DEVELOPMENT OPPORTUNITY IN PRESTIGIOUS OLD GRANADA HILLS!!! A RARE FIND!! OVER 1 ACRE FLAT LOT IN PRIME RESIDENTIAL NEIGHBORHOOD THAT IS ZONED R1-1XL-RFA. LAND COULD POTENTIALLY HAVE 7-8 RESIDENCES BUILT ON IT. (BUYER TO DO THEIR OWN INVESTIGATION AND RELY ON THAT INFO). 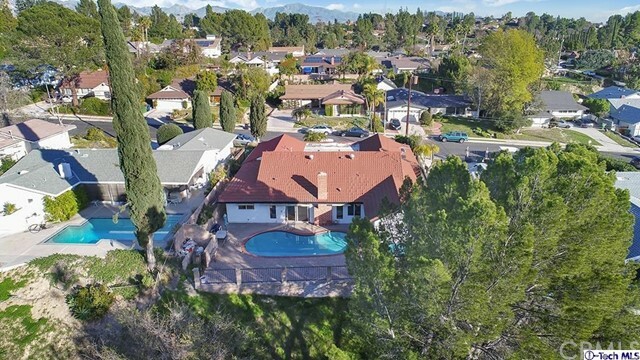 PROPERTY IS WALKING DISTANCE TO HIGHLY DEMANDED GRANADA HILLS CHARTER HIGH SCHOOL AND GRANADA HILLS BUSINESS DISTRICT. CURRENTLY THERE IS A CHARMING 2BD, 2BA HOME ON THE PROPERTY THAT IS RENTED. LOT DIMENSIONS ARE 110X411." "Must See! Unobstructed Jetliner panoramic views! take advantage of this rare opportunity to acquire this magnificent Custom built home overlooking the Knollwood estates with Multi-Million dollar breathtaking views! 2 story home with 4 Large Bedrooms and 4 1/2 bath. This Expansive custom private estate with a formal entryway provides easy access to the media room, office, study, and or exercise room and welcomes guests inside and opens up to a huge living room, dining room, with Laminated hardwood flooring, and a fireplace to set your desired tone. A huge chef's kitchen with granite counters, center island with cook top, walk-in pantry, double oven, beverage refrigerator, custom laminated wood flooring, recess lightings. A Fourth bedroom conveniently located down stairs with private full bath ideal for guests and or maids. Upstairs, 3 large Bedrooms including a Huge Master with a Spacious En-suite and private balcony along with 2 master baths & dual walk-in closets. 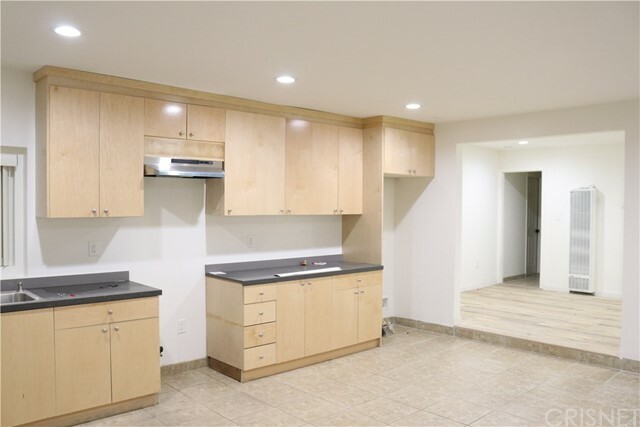 Additionally, 2 bedrooms with private full baths, a huge game room/theater room & laundry room. Fresh paint inside & Out, resort like entertainer s private back yard with newly plastered pool and relaxing views, fire-pit, sports court, huge grassy area, possible RV parking, BBQ area with custom built Pagola, 3 car garage plus plenty of room for extra parking, 3 zone a/c, central vacuum, The home is located adjacent to The Knollwood golf course, CSUN, finest dining & shopping, just minutes to the freeway access etc;"
"Magnificent Custom Gated Estate, situated within the exclusive neighborhood of Granada Hills North of Rinladi. This home features approx. 4516 SF of living space, offering 6 bedrooms & 4.5 baths. This luxurious custom home boasts a beautiful entryway with spiral staircase and high ceilings . Home offers open floor plan, large windows with custom window coverings that allows an abundance of natural light. Property features include spacious living room with elegant fireplace and dinning area. Large gourmet chef's kitchen with granite counter tops, center island with sink, and stainless steel appliances. Off the kitchen, you will also find the cozy family room with fireplace, wet bar and custom built in cabinets. On the the second level, you will find the over-sized master suite with luxurious master bath, walk in closet, and 4 other generously sized bedrooms . There is also the convenience of a guest quarters or in law suite downstairs. 3 Car Garage, Dual A/C system, central vacuum system and brand new tankless water heater. Let's not forget the entertainer's backyard featuring resort like sparkling pool , private garden with lemon and fruit trees. Move quickly as Luxury at this price won't last, A Must see !" 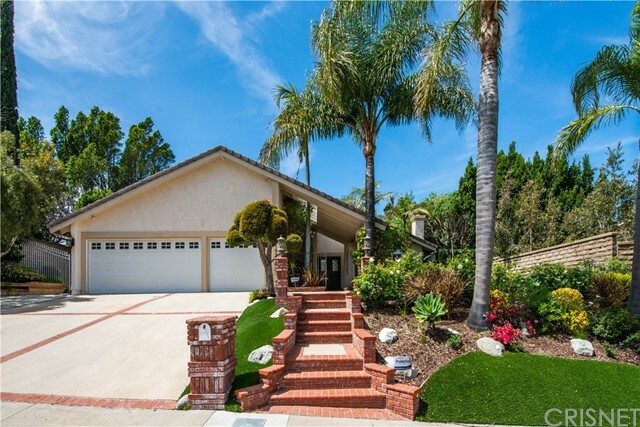 "Sophisticated Granada Hills estate situated on an expansive lot for second structure. With remarkable potential, endless vistas and solar panels, you won't want to miss this opportunity! Relish awe-inspiring views in the resort-like backyard boasting a spacious pool, spa, kitchen and grand patio for dining or lounging al fresco under multiple pergolas. 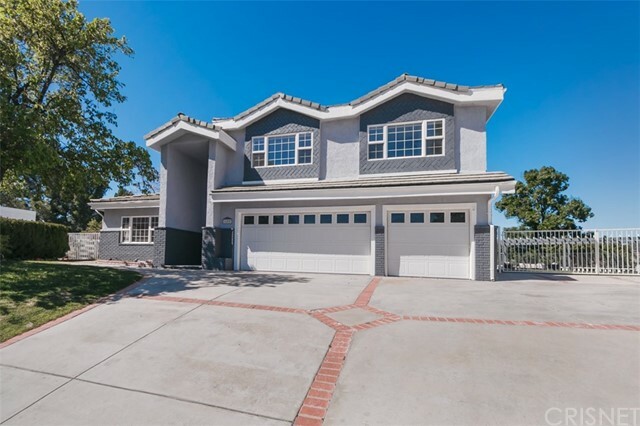 In coveted Granada Hills High School Charter, move-in today and cherish the home's current charm or develop and make your own! The property was recently appraised at $1,300,000." "Meticulously maintained estate home by original owner in popular Greyhawk Ranch in Granada Highlands*Enter from the double door entry to soaring ceilings, rich new hardwood floors throughout most of the main floor, plus new carpet in step down living room - all bathed in warm natural light from the ample walls of windows*Updated kitchen with center island, gleaming slab granite counters & backsplash, refinished cabinets, and breakfast area*Wet bar with granite counters and sitting counter*True formal dining room with French doors leading to the back patio*Family room with built-in entertainment center, brick fireplace, opens to the kitchen, and has a slider to the backyard*Large formal living room with gorgeous fireplace*Music room/office/study*Downstairs bedroom has full bathroom*Indoor laundry room with sink*Powder room with granite counter*4 big bedrooms upstairs - 1 with a double door entry and could be a huge bonus room*Romantic master suite features double door entry, high ceilings, views, 2 way fireplace, private bath with 2 sink areas, soaking tub, separate shower, 2 walk-in closets*Huge backyard with grass play areas and patio deck*2 zone HVAC - one is new*3 car garage*Award winning schools - El Oro, Frost, Granada Charter High School*3,515 sf per builder, 3,277 per tax assessor***"
"Lovely 2 story desirable Granada Charter High School Home. Home Features: 5 Bedrooms (4 upstairs, 1 downstairs). 3 1/2 Bathrooms. Built in 1992. 3861 Square feet. Lot Size: 17286 sq. ft. Huge Den with fireplace. Office. Bar. Dining Room. Office. Inside Laundry Room. Master Bedroom has walk in closet, beautiful tiled bathroom and balcony. Central AC. Circular Driveway. Electric Gates. 2 Car Attached Garage. Large Backyard. 2 Covered Patios. Pool." "Located in the one of the most desired neighborhoods of Knollwood Country Club Estates, This elegant two-story home is located on a secluded corner lot, which is slightly elevated from the street and surrounded by luscious trees and greenery. The home features custom tile entry way, with custom kitchen counter tops and large breakfast counter bar, tile flooring. There are four large bedrooms and 3 baths, there is a bonus room downstairs which can easily be converted back to 5th bedroom if desired. This home also has a huge sun room which leads out to pool and spa with lots of privacy, as well as a 12x50 ft balcony which was just redone last summer. There are three custom fireplaces which makes for cozy entertaining, this is an immaculate home which shows true pride of ownership and was maintained beautifully. BEAUTIFUL ENTERTAINERS BACKYARD WITH POOL ANND SPA, LOTS OF PRIVACY AND GREENERY." 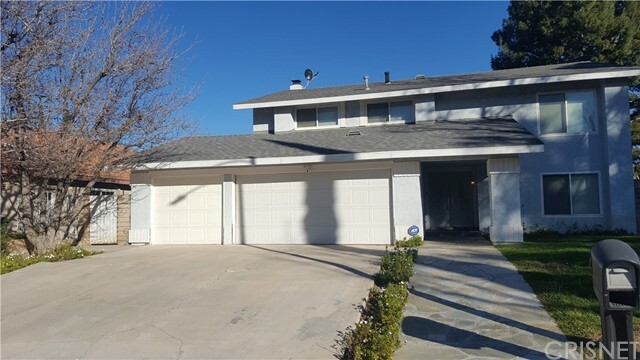 "Welcome to this four bedroom Two and half bath Granada Hills Single Family Residential Ranch Home. Living your day to life in over 2700 sqft. 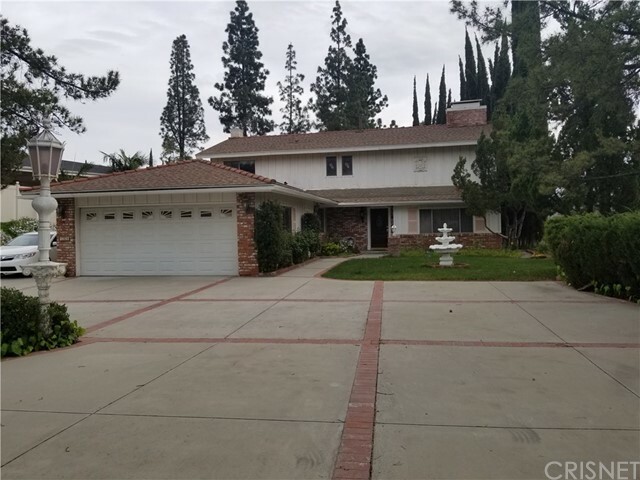 per the Assessor .One of the few one story homes in this North Granada Hills Tract Built in 1989 It will be your Dream home some features worth telling , Updated kitchen that opens into a Warm Cozy Family room. Nice size formal Dinning room, two-half Bath central AC, three car garage with full custom cabinetry. A Master ensuite Bedroom larger Bath , The other three Bedroom arevery nice size. Ready for your Family. An entertainers backyard with plush landscaping, Over 11,000 sqft lots with lot s of playing or relaxing in your private back yard . 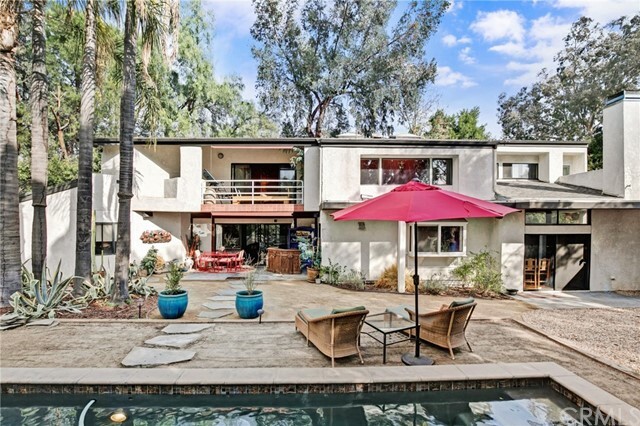 This home features many worth highlighting, Spanish tile roof, and a private block wall around the rear perimeter of the property are some of the other features worth noting. this home is absolutely move in ready with peaceof mnd this home is absolutely move in ready to become your dream home .ALL IT NEEDS IS YOU !!!" 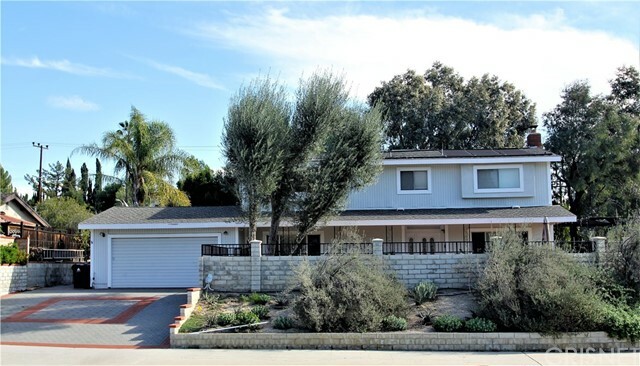 "Looking for a rare 5 bedroom home in Granada Hills? Look no further... functional and desirable layout with 3 bedrooms downstairs! This amazing updated Knollwood Estates, that sides to golf course, has everything you are looking for! Great Curb Appeal! Private entertainers yard sides to 10th hole of the Knollwood Golf Course, allowing for great views. Entertainers yard, with newly re done private pool, above ground spa, multiple covered patios, built in BBQ area w/granite counters and fruit trees. Inside you will find 3044 sq/ft of living space with separate formal living room w/fireplace, separate dining room, separate family room plus additional living space off the large kitchen. Great floor plan with 3 of the bedrooms located on the 1st floor. Upstairs you will find the large master suite w/walk in closet and updated master bath. Another over sized bedroom is located upstairs. Recessed lights. 3 Zoned Central A/C system. Ceiling fans in all the bedrooms. Newer roof. 2 car direct access garage with tons of storage and workshop area. Easy freeway access and centrally located for the commuter." "This is a must see! 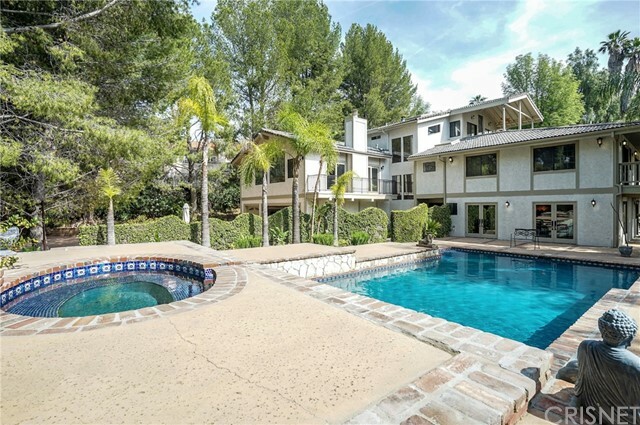 This gorgeous home is located in the most desirable location of the Granada Hills Knollwood Country Club. Spacious and grand, this home was completely renovated in 2018 with newer floors, kitchen, windows and more! The grand entryway leads to a sprawling kitchen with coffered ceilings, top of the line appliances and a spectacular island you have to see to believe. Kitchen also has an area for family space with fireplace. With 4 bedrooms and 4 full bathrooms, this is the ultimate family home. Two master bedrooms with walk in closets and tons of natural lighting. Master bathroom has a beautiful large shower, marble powder area and separate spa tub. Second master has a beautiful claw foot tub in addition to marble powder area and separate shower. If that was not enough, the house hosts a formal large dining room and formal living room apart from each other. Private office. Backyard includes a pool, outdoor seating arrangements and endless views of lush golf course greenery. Privacy is key with this house as you do not have neighbors behind the house. Two car garage with custom shelves for optimum organization. No description is adequate enough to describe this beauty! Book a showing today because this one will go fast!!" "Single family residence with an attached secondary housing unit. 11160 has a separate entrance and has 3 bedrooms and 2 3/4 bathrooms with own electric, gas and water meter and a 3 car driveway parking. The secondary housing unit 11162 has a separate entrance and has 2 bedrooms, 1 full and 1 3/4 bathrooms with own electric, gas, water meter and a driveway with 1 car parking. Danube Elementary and Kennedy High school are only a walking distance. All permits for the secondary housing unit are finalized. Potential income for the 2b/2b is $2,800.00 and the potential income of the 3b/2b is $3,800.00 a potential total income of $6,600.00." 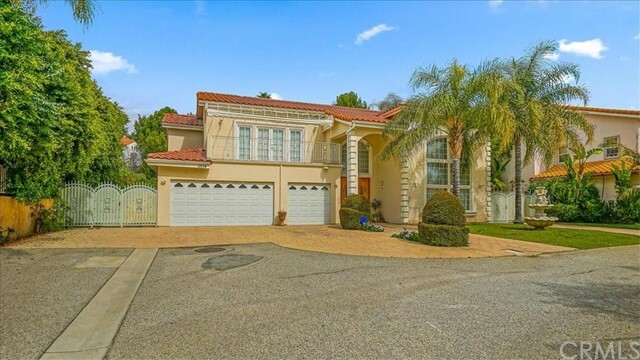 "THIS FABULOUS MEDITERRANEAN HOME IS LOCATED IN CASCADE CYN ESTATE COMMUNITY, UPSCALE NORTH OF RINALDI IN GRANADA HILLS. THIS BRIGHT AND CAPTIVATING 2 STORY HOME OFFERS 5 BR & 3.5 BA, 3 CAR GARAGE WITH DIRECT ACCESS, DUAL PANE WINDOWS, DUAL ZONED HVAC, FIRE SPRINKLER SYSTEM, CENTRAL VACUUM, 1 DOWNSTAIRS BEDROOM WITH FULL BATH, POWDER ROOM AND INDIVIDUAL LAUNDRY ROOM. IT FEATURES DOUBLE DOOR ENTRY WITH DRAMATIC SPIRAL STAIRCASE, STEP DOWN LIVING ROOM WITH VAULTED CEILINGS, HARDWOOD FLOORS AND FIREPLACE, FORMAL DINING ROOM AND LARGE FAMILY ROOM WITH WET BAR AND COZY FIREPLACE OVERLOOKING PRIVATE BACKYARD WITH PATIO. SPACIOUS GOURMET KITCHEN HAS CENTER ISLAND WITH BREAKFAST NOOK, BUILT-IN REFRIGERATOR AND WALK-IN PANTRY. UPSTAIRS MASTER SUITE HAS RETREAT AREA WITH FIREPLACE, FULL BATH AND STALL SHOWER, DOUBLE SINKS AND HIS & HERS CEDAR LINED WALK-IN CLOSETS. THIS HOME IS A DEFINITE MUST SEE!! GREAT VALUE!! AND CONVENIENT TO ALL FREEWAYS!!" "This property is an entertainer's DREAM home. Pull up to your new home located on a Cul-de-sac and enjoy spectacular landscaping, lighting, and a staircase leading up to a grand entry. Step inside to a beautiful open floor plan with vaulted beamed ceilings, beveled glass windows and lots of natural light. The upgraded kitchen is open to the family room and has wonderful cabinet storage as well as countertop space. Retire to the spacious master retreat with a cozy fireplace. The master bathroom has a jetted soaking tub and the master shower has a steam room feature. Other features include surround sound in the family room and back patio, 3 car garage with pull down access to a spectacular storage space, wired security system, exterior cameras, ring doorbell and solar panels. Move in just in time to host spectacular summer parties in this amazing retreat style yard offering a pool with water features and special lighting, spa, built in BBQ and outdoor refrigerator, fire pit, putting green, gazebo, half basketball court, gorgeous landscaping and a phenomenal canyon view. Come see for yourself all this stunning home has to offer!" "$50,000 of PAID OFF solar panels provide energy efficiency while saving the planet. A newly renovated master bathroom is one of the highlights of this spacious 5 bedroom (potentially 6) home. Located on a quiet and safe cul-de-sac the home sits on close to 4,000 sq ft. The recently upgraded kitchen has a double oven, beautiful backsplash and a large pantry. Separate large family dining and formal dining areas. Three large living rooms with two fireplaces and a wet bar. Two large sliding doors open up to a backyard with pool and custom-designed firepit for entertaining. Separate laundry room with storage, bath and access to the garage. Enjoy the neighborhood along with the award winning schools that are close by"
"A Beautiful 4 bedrooms, 3 full bathrooms, with a Pool in the Knollwood Country Club community, close to Country Club and Golf course, in a very quiet neighborhood on a culdesac, with convenient access to 4 freeways. One Bedroom can be considered mother-in-law/maid quarters (separate floor, with bathroom). Walk in closets, and built in shelving in bedrooms. Lots of storage space throughout, full dining room with chandelier, wood shutters, granite kitchen counter-tops, new pre-engineered wood flooring, Sub-Zero refrigerator, double gas oven, built-in microwave, double sink plus separate prep sink, large pantry with pull out shelves, built in wine rack. Living room with high ceiling, stone fireplace. New water heater, new exterior with energy efficient coating-paint-like, with lifetime guarantee, new roof, main drain to street recently replaced, solid oak front double door. A large and back-yard w/pool with plenty foliage for privacy. A well maintained house with long time owners"
"Beautiful Granada Highlands 2 story pool home. 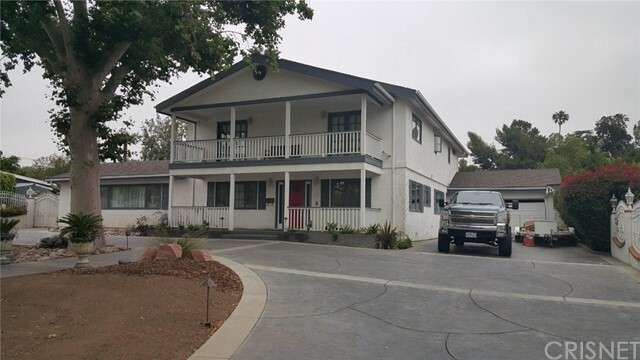 This home offers 5 bedrooms and 3 baths in 2288 sqft on an almost 11,000 foot lot built in 1964. Enter this updated traditional home through the double door s into a the foyer featuring light and bright marble fooring leading to the expansive livingroom with a custom woodburning fireplace and formal dining area. The updated eat-in kitchen has spacious granite counters, loads of cabinets, a peninsula island with breakfast bar that opens to the familyroom area. The spacious master suite features a direct access masterbath. There are an additional 4 bedrooms and 2 updated baths that feature marble bath areas. The rear yard is an entertainers paradise featuring an inground solar heated pool, separate gazebo covered spa area, large outdoor kitchen with stainless steel sink and counters and a Wolf Gas Stove, several brick patio areas and an separate wood deck. Additional features include a private gated brick paved courtyard in front, dual zone central heat and air, crown moldings throughout, tankless hot waterheater, direct access 2 car garage. This home is close to El Oro Way Elementary School and Robert Frost Middle School, several parks, Knollwood golf course, shopping and transportation." "WONDERFUL CUL-DE-SAC HOME. LARGE FLAT IRREGULAR LOT, MOST OF THE GRASS IS IN THE FRONT LAWN AREA. POOL IN BACKYARD OF THIS 5 BEDROOM 3 BATH HOUSE. FLOORING IS OF CERAMIC TILES THAT ARE FASHIONED TO LOOK LIKE WOOD, STONE AND CARPET. RICH WOOD COLORING BANNISTER ON STAIRS WHICH LEAD TO ALL 5 BEDROOMS, UPSTAIRS. THERE IS AN ALARM SYSTEM THAT THE SELLER WILL LEAVE WITH THE HOUSE IF REQUESTED IN THE OFFER. MANY NEWER FEATURES. THERE IS A 3 CAR GARAGE FOR THE LARGE FAMILY. IN THE FAMILY ROOM THERE IS A MOTORIZED AND RETRACTABLE EXTERIOR SCREEN OVER THE LARGE SLIDING GLASS DOORS TO PROVIDE SHADE FROM OUTDOOR LIGHT WHILE YOU ARE WATCHING A LARGE SCREEN T.V. THE HOUSE IS READY TO MOVE IN, NOW !!!"